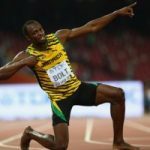 USAIN Bolt no longer has the title of triple-triple Olympic champion after his Jamaican sprint relay team-mate Nesta Carter was disqualified from the 2008 Beijing Games for failing a drugs test. The 31-year-old Carter ran the first leg in the 4×100 metres relay in Beijing, helping Jamaica to a new world record of 37.10 seconds and Bolt to his third Olympic gold medal. But the International Olympic Committee has now stripped the Jamaicans of that victory after a re-analysis of Carter’s anti-doping sample tested positive for the banned stimulant methylhexaneamine. Bolt, who repeated the 100-200-relay triple in London and Rio, and his team-mates have known this day was coming since last summer, when rumours of Carter’s positive test first surfaced. Bolt, Carter, Michael Frater, Asafa Powell and Dwight Thomas, who ran in the heats, will now have to return their gold medals, with Trinidad & Tobago, Japan and Brazil the new one-two-three. Methylhexaneamine is an energy-boosting ingredient in many dietary supplements and several Jamaican athletes have failed tests for it before, including five sprinters in 2009. Given its prevalence, though, sanctions tend to be on the lenient side, with bans of three to six months common. The loss of an Olympic gold is an unusually strict punishment. While there may be some sympathy for Carter and company, news that Tatyana Lebedeva has also been caught in the IOC’s 2008 and 2012 re-testing programme will not attract much pity. The winner of 17 global medals during a glittering career, Lebedeva claimed silver medals in the long jump and triple jump in Beijing but now loses those thanks to a positive test for the steroid turinabol. Now 40, the Russian will keep the long jump gold she won in Athens in 2004 and triple jump silver she won in Sydney four years earlier. She is also a three-time outdoor and indoor world champion. She skipped most of the 2010 and 2011 seasons to have her second daughter but returned to competition for the London Olympics in 2012, when she came 10th in the triple jump. Nigeria’s Blessing Okagbare should inherit her long jump silver from Beijing, with Jamaican Chelsea Hammond stepping up to bronze. With the original bronze-medal winner Hrysopiyi Devetzi of Greece already banned from triple jump, Lebedeva’s silver should go to Olga Rypakova of Kazakhstan, and Cuba’s Yargelis Savigne will now get bronze.